The figure of Harlequin crops up in Picasso’s work from 1901 to his very last years. A mischievous and protean figure of the Commedia dell’arte, the artist invests him with great autobiographical significance. 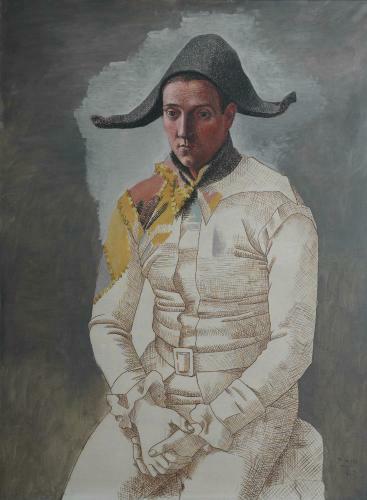 Harlequin plays the role of a melancholic double, embodiment of the artist’s isolation and fragility. The face is that of Picasso’s friend the Spanish painter Joachin Salvado, who posed for Derain in the same costume, owned by Picasso. The feigned unfinishedness of the painting highlights by contrast the precise and masterly drawing, heir to the classical tradition and attentive to the example of Jacques-Louis David and Jean-Auguste-Dominique Ingres.